Community Rejuvenation Project artists Desi Mundo and Pancho Peskador have completed Phase I of the monumental Alice Street Mural Project, capping two weeks of intensive painting which often saw the artists pulling ten-hour days. 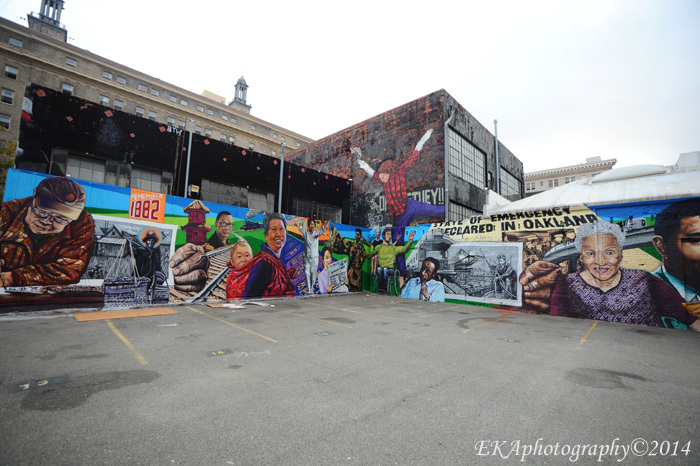 The first wall, completed earlier in July, covered a large wall facing the Malonga Casquelord Center for the Arts on Alice and 14th Sts., which was decorated with portraits of Malonga, dancer Carla Service, an Ohlone Indian chief and drummer, social justice activist Cephus “Uncle Bobby” Johnson, Dimensions Dance Theater youth participants, Chinese lions, dragons and other imagery incorporating the history of that neighborhood. Next, the CRP artists tackled the two rear-most facing walls of the parking lot at Alice and 14th, covering them with intricate designs, portraits, and historical archival images. Wall #1 focuses heavily on the backstory of the Hotel Oakland, Oakland’s Chinatown, and the city’s Chinese-language-speaking community. The wall begins with Hotel Oakland’s resident calligrapher Zhao, and goes on to include images of residents of the historic building, historian Roy Chan, the original Chinatown and its inhabitants in the 19th century, railroads, trains, and street cars – symbolizing Chinese labor as well as displacement – a crosswalk pattern from today’s Chinatown, and a contemporary Chinese-American woman reading a newspaper announcing the election of the country’s first Asian-American female mayor. The wall concludes with a portrait of Tyler Thompson, an African American Chinese opera singer and performer from Oakland’s Purple Silk Foundation, representing a cultural link between Oakland’s African American and Chinese communities. A sign reading “Remember 1882” refers to the Chinese Exclusion Act, a since-repealed discriminatory law which prevented the families of Chinese laborers from immigrating to America. Wall #2 begins with three dancers from the Axis Dance Company, a physically-integrated movement arts troupe, based out of the Malonga Center. Ishmael Flory, a radical organizer with the Pullman porters and contemporary of C.L. Dellums, is pictured against a backdrop of an archival train. Above Flory’s portrait is a newspaper headline and sepia-toned photo commemorating the 1946 general strike, a flashpoint in the labor activist movement. 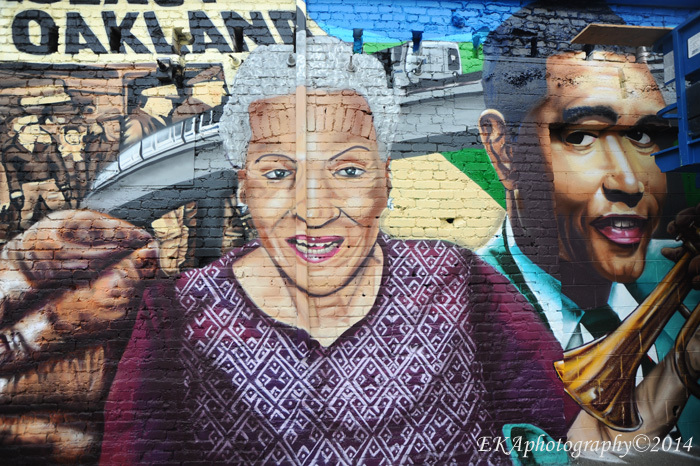 The wall’s centerpiece is a portrait of Jerri Lange, an African American female media pioneer, author, and Oakland icon – who still lives on the block. To the right of Lange are photo-realistic images of martyred journalist Chauncey Bailey, legendary trumpeter Kahlil Shaheed, and harpist Destiny Muhammad — a current Malonga resident. On the wall’s right-most corner is a flyer announcing the Oakland Ensemble Theatre production of “Sisters” – to this day, the most-successful production held at the venue. A BART train and tracks, symbolizing the evolution of transportation as well as the forced community upheaval caused by construction, complete the wall. The three completed walls of the Alice St. mural represent visual storytelling at its finest, showing the history, evolution, and development of two communities, and their resiliency in the face of displacement and gentrification. 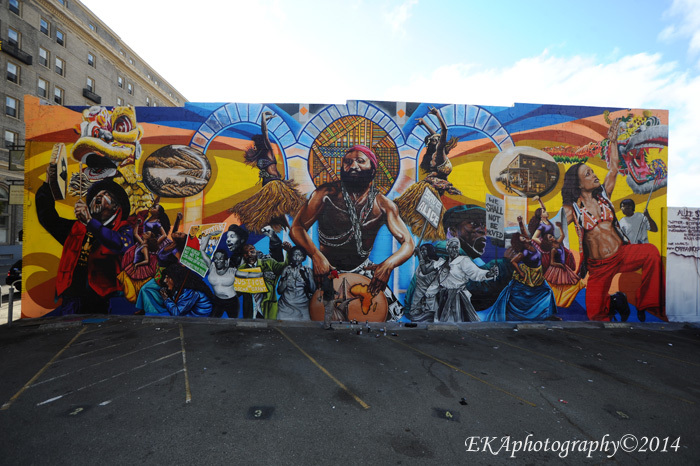 The mural reflects the influence and importance of dual cultures to the neighborhood, whose census tract is said to be the most diverse in Oakland. Phase II, comprising a massive wall facing the hotel Oakland, is expected to be completed by the end of September; a ribbon-cutting ceremony celebrating the completion of Phase I has been scheduled for Friday, August 8, at 3:30 p.m. at the corner of 14th and Alice Sts. Work has also begun on a companion documentary highlighting the mural creation process and including additional historical and educational materials, as well as dozens of interviews with community residents and passers-by. For more information, visit the event page, the CRP homepage, or the Alice St. Mural Project’s Facebook page.